This article is about skeletal muscle relaxants. For information on smooth muscle relaxants, see antispasmodic. The earliest known use of muscle relaxant drugs was by natives of the Amazon Basin in South America who used poison-tipped arrows that produced death by skeletal muscle paralysis. This was first documented in the 16th century, when European explorers encountered it. This poison, known today as curare, led to some of the earliest scientific studies in pharmacology. Its active ingredient, tubocurarine, as well as many synthetic derivatives, played a significant role in scientific experiments to determine the function of acetylcholine in neuromuscular transmission. By 1943, neuromuscular blocking drugs became established as muscle relaxants in the practice of anesthesia and surgery. The U.S. Food and Drug Administration (FDA) approved the use of carisoprodol in 1959, metaxalone in August 1962, and cyclobenzaprine in August 1977.
ions to leave the cell, causing a depolarization of the end plate, resulting in muscle contraction. Following depolarization, the acetylcholine molecules are then removed from the end plate region and enzymatically hydrolysed by acetylcholinesterase. Normal end plate function can be blocked by two mechanisms. Nondepolarizing agents, such as tubocurarine, block the agonist, acetylcholine, from binding to nicotinic receptors and activating them, thereby preventing depolarization. Alternatively, depolarizing agents, such as succinylcholine, are nicotinic receptor agonists which mimic Ach, block muscle contraction by depolarizing to such an extent that it desensitizes the receptor and it can no longer initiate an action potential and cause muscle contraction. Both of these classes of neuromuscular blocking drugs are structurally similar to acetylcholine, the endogenous ligand, in many cases containing two acetylcholine molecules linked end-to-end by a rigid carbon ring system, as in pancuronium (a nondepolarizing agent). The generation of the neuronal signals in motor neurons that cause muscle contractions are dependent on the balance of synaptic excitation and inhibition the motor neuron receives. Spasmolytic agents generally work by either enhancing the level of inhibition, or reducing the level of excitation. Inhibition is enhanced by mimicking or enhancing the actions of endogenous inhibitory substances, such as GABA. Because they may act at the level of the cortex, brain stem or spinal cord, or all three areas, they have traditionally been referred to as "centrally acting" muscle relaxants. However, it is now known not every agent in this class has CNS activity (e.g. dantrolene), so this name is inaccurate. Spasmolytics such as carisoprodol, cyclobenzaprine, metaxalone, and methocarbamol are commonly prescribed for low back pain or neck pain, fibromyalgia, tension headaches and myofascial pain syndrome. However, they are not recommended as first-line agents; in acute low back pain, they are not more effective than paracetamol or nonsteroidal anti-inflammatory drugs (NSAIDs), and in fibromyalgia they are not more effective than antidepressants. Nevertheless, some (low-quality) evidence suggests muscle relaxants can add benefit to treatment with NSAIDs. In general, no high-quality evidence supports their use. No drug has been shown to be better than another, and all of them have adverse effects, particularly dizziness and drowsiness. Concerns about possible abuse and interaction with other drugs, especially if increased sedation is a risk, further limit their use. A muscle relaxant is chosen based on its adverse-effect profile, tolerability, and cost. Muscle relaxants (according to one study) were not advised for orthopedic conditions, but rather for neurological conditions such as spasticity in cerebral palsy and multiple sclerosis. Dantrolene, although thought of primarily as a peripherally acting agent, is associated with CNS effects, whereas baclofen activity is strictly associated with the CNS. Muscle relaxants are thought to be useful in painful disorders based on the theory that pain induces spasm and spasm causes pain. However, considerable evidence contradicts this theory. In general, muscle relaxants are not approved by FDA for long-term use. However, rheumatologists often prescribe cyclobenzaprine nightly on a daily basis to increase stage 4 sleep. By increasing this sleep stage, patients feel more refreshed in the morning. Improving sleep is also beneficial for patients who have fibromyalgia. Muscle relaxants such as tizanidine are prescribed in the treatment of tension headaches. Diazepam and carisoprodol are not recommended for older adults, pregnant women, or people who suffer depression or for those with a history of drug or alcohol addiction. Because of the enhancement of inhibition in the CNS, most spasmolytic agents have the side effects of sedation, drowsiness and may cause dependence with long-term use. Several of these agents also have abuse potential, and their prescription is strictly controlled. Baclofen is considered to be at least as effective as diazepam in reducing spasticity, and causes much less sedation. It acts as a GABA agonist at GABAB receptors in the brain and spinal cord, resulting in hyperpolarization of neurons expressing this receptor, most likely due to increased potassium ion conductance. Baclofen also inhibits neural function presynaptically, by reducing calcium ion influx, and thereby reducing the release of excitatory neurotransmitters in both the brain and spinal cord. It may also reduce pain in patients by inhibiting the release of substance P in the spinal cord, as well. The hydantoin derivative dantrolene is a spasmolytic agent with a unique mechanism of action outside of the CNS. It reduces skeletal muscle strength by inhibiting the excitation-contraction coupling in the muscle fiber. 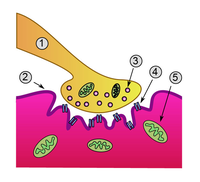 In normal muscle contraction, calcium is released from the sarcoplasmic reticulum through the ryanodine receptor channel, which causes the tension-generating interaction of actin and myosin. Dantrolene interferes with the release of calcium by binding to the ryanodine receptor and blocking the endogenous ligand ryanodine by competitive inhibition. Muscle that contracts more rapidly is more sensitive to dantrolene than muscle that contracts slowly, although cardiac muscle and smooth muscle are depressed only slightly, most likely because the release of calcium by their sarcoplasmic reticulum involves a slightly different process. Major adverse effects of dantrolene include general muscle weakness, sedation, and occasionally hepatitis. Muscle relaxants are very powerful drugs that may produce negative effects, including heart failure and paralysis. Patients most commonly report sedation as the main adverse effect of muscle relaxants. Usually, people become less alert when they are under the effects of these drugs. People are normally advised not to drive vehicles or operate heavy machinery while under muscle relaxants' effects. Cyclobenzaprine produces confusion and lethargy, as well as anticholinergic side effects. When taken in excess or in combination with other substances, it may also be toxic. While the body adjusts to this medication, it is possible for patients to experience dry mouth, fatigue, lightheadedness, constipation or blurred vision. Some serious but unlikely side effects may be experienced, including mental or mood changes, possible confusion and hallucinations, and difficulty urinating. In a very few cases, very serious but rare side effects may be experienced: irregular heartbeat, yellowing of eyes or skin, fainting, abdominal pain including stomach ache, nausea or vomiting, lack of appetite, seizures, dark urine or loss of coordination. Patients taking carisoprodol for a prolonged time have reported dependence, withdrawal and abuse, although most of these cases were reported by patients with addiction history. These effects were also reported by patients who took it in combination with other drugs with abuse potential, and in fewer cases, reports of carisoprodol-associated abuse appeared when used without other drugs with abuse potential. Common side effects eventually caused by metaxalone include dizziness, headache, drowsiness, nausea, irritability, nervousness, upset stomach and vomiting. Severe side effects may be experienced when consuming metaxalone, such as severe allergic reactions (rash, hives, itching, difficulty breathing, tightness in the chest, swelling of the mouth, face, lips, or tongue), chills, fever, and sore throat, may require medical attention. Other severe side effects include unusual or severe tiredness or weakness, as well as yellowing of the skin or the eyes. When baclofen is administered intrathecally, it may cause CNS depression accompanied with cardiovascular collapse and respiratory failure. Tizanidine may lower blood pressure. This effect can be controlled by administering a low dose at the beginning and increasing it gradually. ^ "Definition of Muscle relaxant." MedicineNet.com. (c) 1996–2007. Retrieved on September 19, 2007. ^ a b c d e f g h Miller, R.D. (1998). "Skeletal Muscle Relaxants". In Katzung, B.G. (ed.). Basic & Clinical Pharmacology (7th ed.). Appleton & Lange. pp. 434–449. ISBN 0-8385-0565-1. ^ Bowman WC (January 2006). "Neuromuscular block". Br. J. Pharmacol. 147 Suppl 1: S277–86. doi:10.1038/sj.bjp.0706404. PMC 1760749. PMID 16402115. ^ a b "Brief History". Retrieved 2010-07-09. ^ Craig, C.R. ; Stitzel, R.E. (2003). Modern Pharmacology with clinical applications. Lippincott Williams & Wilkins. p. 339. ISBN 0-7817-3762-1. ^ "M03B Muscle Relaxants, Centrally acting agents". ATC/DDD Index. WHO Collaborating Centre for Drug Statistics Methodology. ^ "M03CA01 Dantrolene". ATC/DDD Index. WHO Collaborating Centre for Drug Statistics Methodology. ^ Ellis KO, Castellion AW, Honkomp LJ, Wessels FL, Carpenter JE, Halliday RP (June 1973). "Dantrolene, a direct acting skeletal muscle relaxant". J Pharm Sci. 62 (6): 948–51. doi:10.1002/jps.2600620619. PMID 4712630. ^ a b c d e f See S, Ginzburg R (2008). "Choosing a skeletal muscle relaxant". Am Fam Physician. 78 (3): 365–370. ISSN 0002-838X. PMID 18711953. ^ Chou R, Qaseem A, Snow V, Casey D, Cross JT, Shekelle P, Owens DK (October 2007). "Diagnosis and treatment of low back pain: a joint clinical practice guideline from the American College of Physicians and the American Pain Society". Ann. Intern. Med. 147 (7): 478–91. PMID 17909209. ^ a b Beebe FA, Barkin RL, Barkin S (2005). "A clinical and pharmacologic review of skeletal muscle relaxants for musculoskeletal conditions". Am J Ther. 12 (2): 151–71. doi:10.1097/01.mjt.0000134786.50087.d8. PMID 15767833. ^ See S, Ginzburg R (February 2008). "Skeletal muscle relaxants". Pharmacotherapy. 28 (2): 207–13. doi:10.1592/phco.28.2.207. PMID 18225966. ^ "When Are Muscle Relaxers Prescribed For Arthritis Patients?". Retrieved 2010-07-09. ^ "Muscle Relaxants". Retrieved 2010-07-09. ^ Rang, H.P. ; Dale, M.M. (1991). "Drugs Used in Treating Motor Disorders". Pharmacology (2nd ed.). Churchill Livingston. pp. 684–705. ISBN 044304483X. ^ Standaert, D.G. ; Young, A.B. (2001). "Treatment Of Central Nervous System Degerative Disorders". In Goodman, L.S. ; Hardman, J.G. ; Limbird, L.E. ; Gilman, A.G. (eds.). Goodman & Gilman's The Pharmacological Basis of Therapeutics (10th ed.). McGraw Hill. pp. 550–568. ISBN 0071124322. ^ Charney, D.S. ; Mihic, J.; Harris, R.A. (2001). "Hypnotics and Sedatives". Goodman & Gilman's. pp. 399–427. ^ Cazalets JR, Bertrand S, Sqalli-Houssaini Y, Clarac F (November 1998). "GABAergic control of spinal locomotor networks in the neonatal rat". Ann. N. Y. Acad. Sci. 860: 168–80. doi:10.1111/j.1749-6632.1998.tb09047.x. PMID 9928310. ^ Young, R.R., ed. (1994). "Symposium: Role of tizanidine in the treatment of spasticity". Neurology. 44 (Suppl 9): 1. PMID 7970005. ^ Bras H, Jankowska E, Noga B, Skoog B (1990). "Comparison of Effects of Various Types of NA and 5-HT Agonists on Transmission from Group II Muscle Afferents in the Cat". Eur. J. Neurosci. 2 (12): 1029–1039. doi:10.1111/j.1460-9568.1990.tb00015.x. PMID 12106064. ^ Jankowska E, Hammar I, Chojnicka B, Hedén CH (February 2000). "Effects of monoamines on interneurons in four spinal reflex pathways from group I and/or group II muscle afferents". Eur. J. Neurosci. 12 (2): 701–14. doi:10.1046/j.1460-9568.2000.00955.x. PMID 10712650. ^ Young RR, Wiegner AW (June 1987). "Spasticity". Clin. Orthop. Relat. Res. (219): 50–62. PMID 3581584. ^ "The Effects of Muscle Relaxant Drugs Are Powerful". Retrieved 2010-07-09. ^ "Side Effects of Metaxalone – for the Consumer". Retrieved 2010-07-09. ^ "Precautions". Encyclopedia of Surgery. Retrieved 2010-07-09.